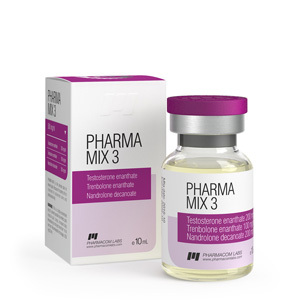 Release form: bottle of 10 ml, 1 ml – 500 mg.
Pharma Mix-3 Pharmacom – is an anabolic, which has a high anabolic and relatively low androgenic effect. Produced by the famous Moldovan pharmacological company PharmaCom Labs. This type of mix is ​​known not so long ago, but it has already managed to catch the fancy of many athletes in the field of bodybuilding and other strength sports because of their ability to quickly build up muscle mass. For 8 weeks, the mix dosage should be 500 mg (1 ml) per week. This is enough to achieve 8-10 kg of high-quality muscle mass, as well as to dry thoroughly. It is also worth noting that excess dosages and increased injections do not lead to a better result, but only increase the chance of side effects. From 2 weeks of the course should be tested for estradiol and prolactin. If these analyzes are too high or are at the limits of the reference values, you should start taking Dostinex and Anastrozole. Anastrozol drink 0.5 tab. every 3 days, and Dostinex on 1 tab. every week (once every 7 days). Every 2 weeks we pass tests and monitor the level of these hormones in order to adjust the dosage of AI (aromatase inhibitors) and PI (prolactin inhibitors) up or down. More experienced athletes can add to the course such drugs as: Turinabol, Methane, Stanozolol, etc. because this mix is ​​perfectly combined with almost all types of anabolic steroids. If you have a predisposition to these side effects, it is better not to use this mix. But if you adhere to the above recommendations, the chance of side effects can be reduced to zero. It is also worth remembering that increasing dosages and increasing injections can entail the same negative consequences.